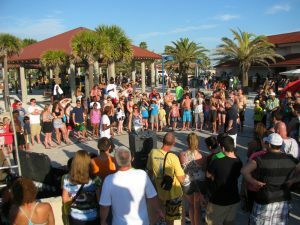 Every weekend at Clearwater Beach, something special happens. Amid the bustle of the nightly festival, the city puts on a show. On the lawn of Pier 60 Park, a large movie screen is erected, or should we say, inflated? The inflatable screen rises at the bottom of a nearly imperceptible slope of the grassy park. The sun is usually setting by that time, creating the right atmosphere for movie night at the beach. Before the movie starts, however, Pier 60 puts on a whole other type of show. Vendors line the pier starting two hours before sunset, selling knickknacks and artwork. Buskers arrive to entertain the crowds that will soon fill the area, while artists set up booths where they will personally interact with the crowd. If you know the event is coming, it might entertain you to find a seat and watch them all arrive. You can sit on the concrete wall along the sidewalk or get an ice cream and sit at the snack bar picnic tables. Alone or in groups, they approach along the sidewalks, often pulling wagons loaded with gear. Setting up draws watchers all by itself and, soon, with the sun nearing the horizon, the fun begins. The buskers draw the best crowds, cracking whips, tumbling, or eating fire. With plenty to do and see, Pier 60 becomes a popular destination any night of the week. On weekends, however, it gets even busier. The vendors, artists, and performers know the weekend visitors arrive in larger numbers and so you are likely to see more acts on Friday, Saturday nights. And that, of course, is when the movies roll. When the sun has set and darkness has fallen, it’s movie time. Weekends mean that the free cinema is up and running. 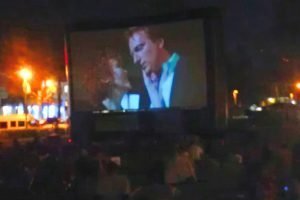 Called Sunset Cinemas at Pier 60, the event is often well attended. With a great big screen and plenty of volume, even those that didn’t intend to watch a movie will often take a seat. Top movies are shown, every big-name movie following on the heels of the theater releases. Beauty and the Beast, Doctor Strange, The Little Mermaid, Mary Poppins, and other major hits from the present and the past appear on the air-filled screen. All are suitable for a general audience… well, mostly. The action can be intense in some, like the Twilight series or Marvel Comics movies, but in a free movie setting with no walls, parents have the freedom to make the choice. Sitting on the lawn with the beach nearby and the Pier 60 Nightly Sunset Festival happening in full swing behind you is a fantastic setting. The lights of the town come up and the sounds of a bustling beach town fill the air. When the movie is over, it’s time to head onto other beach adventures. Is it dinner and ice cream, a walk down gift shop lined sidewalks, an evening boat tour, or will the kids be ready for bed? What you do next is up to you. 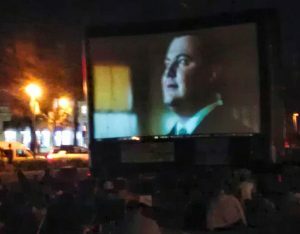 To find out what movies are showing, visit the Sunsets at Pier 60 website. 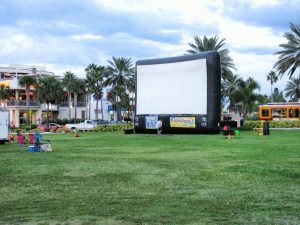 One word of advice for visitors to Clearwater Beach; whether you attend the Cinemas at Pier 60 or not, be sure to head down to the waterfront at sunset to enjoy this one of a kind venue for the perfect beach vacation.